List Price 1.99лв. VAT Incl. 1.89лв. VAT Incl. 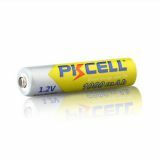 Rechargeable Battery 1.2V 1000mAh AAA Ni-MH Rechargeable battery with rated voltage 1.2 V and capacity 1200 mAh. 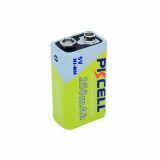 Rechargeable Battery 6F22, 8.4VDC, 6P, 250mAh Rechargeable battery, 6P, with voltage 9 VDC and capacity 250 mAh. The price is for 1 battery!